There is nothing possible without machines in our lives, in today’s world machines have become indispensable as they lend great aid in making any task easy and valid. There are numerous machines and equipments which are used in the treatment of various diseases and our experts at Delhi Physio believe in giving both manual as well as mechanical remedy of the diseases. The equipments that are put to use in the Physiotherapy helps the patients to recover from the ailments. It’s not just the machines and instruments that support the healing process but also the furniture integrated in our clinic makes the person feel comfortable on his visit. Our Physiotherapy Equipments like chair couch, table aim to provide relaxation and reduce pain which occurs during the healing of joints, muscles and nerves. When patients come for examination and diagnosis, he is made to relax on a fully cushioned and adjustable flat bench with head support which can be adjusted in various angles and degrees at the time of a check up and also used during the physical therapy sessions for massage. Weights are also employed while exercising hands, legs etc. Our Physiotherapy sessions also motivate the patients to engage exercise balls and elastic bands .In order to tackle strain in the back and spine, large ball filled with air and integrated stool is put to use. Without any cut medications below the skin are given using electrotherapy and ultrasound machines. These machines and several other machines used for the treatment hold lot of prominence to the physiotherapists. 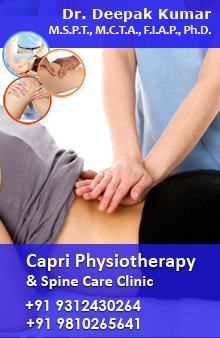 Delhi Physio aims to provide vital treatment to the patients with full reliability and accountability.